I'd hoped to get it posted much earlier but with sick kids, parties, Christmas shopping, baking, etc. there just hasn't been a lot of spare time. You know how it is... Tis' the season for over-doing. But this season I tried not to over do it. And, I almost succeeded.... I think. 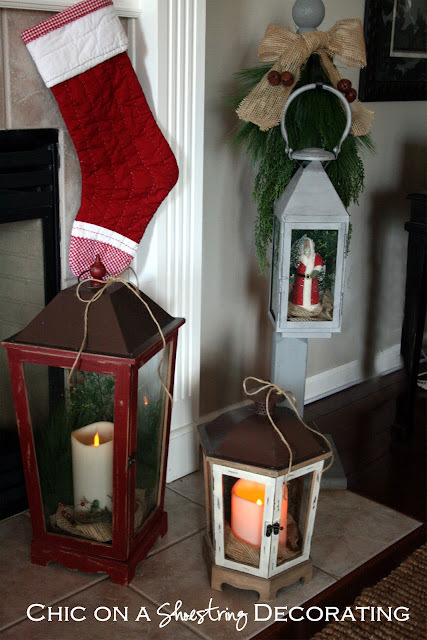 Anywho, welcome to my Christmas Home Tour Part 2, Rustic Christmas. Be sure to check out my "fancy" Christmas decor in Part 1. We'll start with my mantel. I loved the rustic look I did on my kitchen console table last year. DIY Network even featured it on their site! I decided I could pull off a rustic Christmas mantel on the cheap using mostly stuff I already have. I busted out my old 90% off red candle holders that I bought with the intention of spray painting. They are marvelously Christmas rustic looking so I’m so glad I didn’t. The birch candles were 80% off from Hob Lob’s after Fall sale. (they are definitely not just for Fall, score!) I used some of the Christmas trees that I had and that was that. I used an old wreath and made it look new by adding a few of these burlap-ish flowers I scored for half off at Hob Lob and adding some burlap ribbon through it. I got this huge red lantern for $8 after Christmas last year! It was 90% off and a super score deal in the game. It is ginormous and I heart it. I was planning to put it on my porch but then I couldn’t stand thinking that it would get rained/sleet/snowed/iced on and likely only last a few seasons. And if it was by my front door I wouldn't get to see it much because I always come in the garage. Bummer. I made an executive decision and saved it’s life by sticking it by my fireplace alongside another lantern that I keep there all year. Your welcome, Ginormous Red Lantern. My friend made the awesome lantern stand that is now a permanent fixture on my fireplace hearth (it will never be pantless again!). I dressed it up with a few faux greenery swags and a big burlap bow. I made the bow myself after following extremely confusing instructions and some cursing I found online. I’m not sure if I like it, it is kind of like the post is wearing a big, fat, little girl hair bow looking thing. I added some jingle bells to distract from the poor bow formation. I changed it up by sticking a Santa in the lantern instead of a candle. Further distracting from the burlap hair bow. 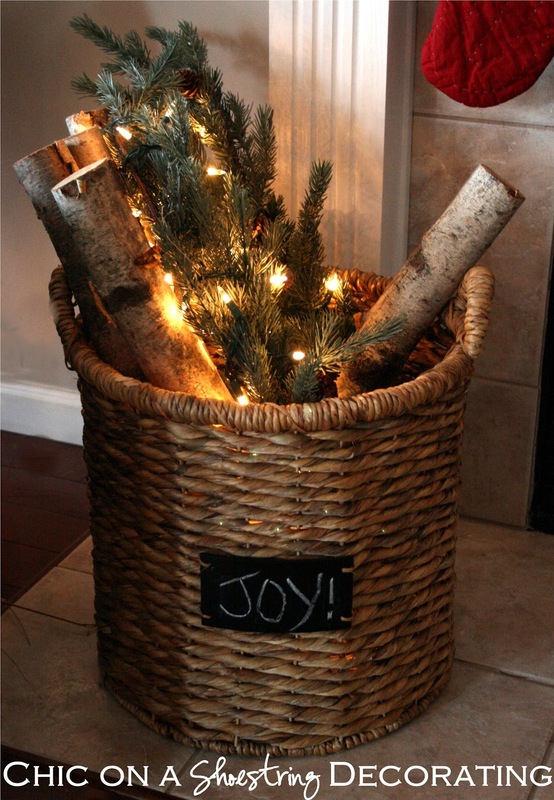 On the other side of the fireplace hearth I stuck some birch branches in my blanket basket along with some greenery. It's sort of gives a cozy rustic glow. My stocking are from Pottery Barn Kids and have a train, airplane and my boy's names on the other side of them. I staged them with the red side showing for my pictures but the other side actually doesn't look bad. The boys were highly offended that I had put up their stockings "backwards". Of course I changed them back after the pics. I got a new pillow that I am completely in love with... a TJ Maxx find (of course). I've seen similar ones for 3 times what I paid for it. I hung it over my sideboard which holds a simple wooden tray full of greenery and votives. I'm loving this vignette and thinking it's neutral enough I can leave it up all winter. Although the red in the wreath is kinda screaming Christmas at me. Maybe I could keep the wreath but lose the red flowers after Christmas. It's a plan. PS: Consider joining me in January for a book club studying 31 Days to Build a Better Blog by ProBlogger Darren Rowse. Learn more and sign up in the comments here. Your Christmas decorating is lovely and that burlap wreath is all kinds of awesome! Merry Christmas!